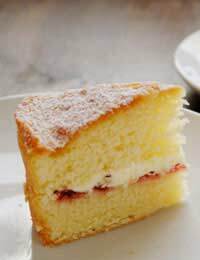 Sponge cakes are always a favourite. They can be adapted easily and work well in sugar free varieties. Different sugar free fillings can also be whipped up quickly. These recipes make great birthday cakes or tea time treats. They are also popular at cake sales and children’s parties. This light sponge is always a winner. Team it up with sugar free strawberry jam and whipped cream or make another delicious filling. Preheat your oven to 170 deg C/325 deg F/gas mark 3. Melt your margarine and honey in a small pan over a low heat. Then sieve your flour into a large bowl. Stir in the hot liquid. Beat your eggs and stir those in too. When thoroughly mixed, spoon the mixture into an 18cm (eight ins) cake tin. Bake in the centre of the oven for approximately 30-35 minutes until risen and an inserted skewer comes out clean. Remove from the heat and leave to cool for 10 minutes. Then turn out from the tin and place on a rack to cool further. Slice in half and spread with sugar free strawberry jam before replacing the top. Serve with whipped cream. This unusual sponge cake is a summer favourite. Again, try it with whipped cream or sugar free ice-cream. Preheat your oven to 200 deg C/400 deg F/gas mark 6. Cream your butter and granulated sweetener. Beat your eggs and mix them in. Sieve your flour and stir it in. Grease an 18cm (eight ins) cake tin. Melt your sauce butter in a small pan. Add your raspberries and cook gently for a few minutes. Pour into the bottom of your greased tin. Top with your sponge mixture. Bake in the centre of the over for about 20 minutes, until firm to the touch. Turn out and serve with sugar free ice-cream. This is a tasty sponge cake that youngsters and adults alike will love. Cut it into thin slices to make the most of the marble effect. Preheat your oven to 180 deg C/350 deg F/gas mark four. Melt your margarine and honey in a small pan over a low heat. Then sieve your flour into a large bowl. Stir in the hot liquid. Beat your eggs and stir those in too. Split your mixture in half, placing in two separate dishes. Into one, sieve your cocoa powder and stir well. Slowly swirl your chocolate mixture into the plain mixture. Carefully place into a greased 18cm (eight ins) cake tin. Bake in the centre of the oven for approximately 20 minutes until risen and an inserted skewer comes out clean. Remove from the heat and leave to cool for 10 minutes. Slice and serve.